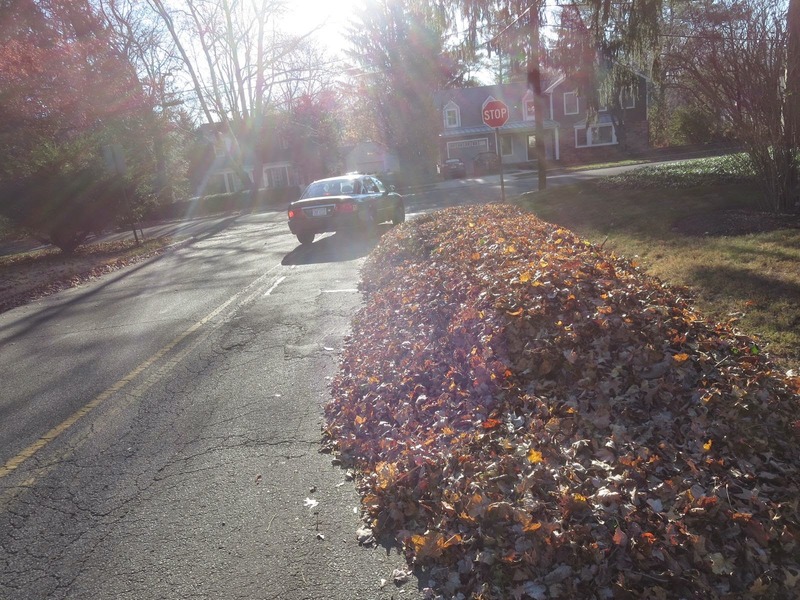 Before there were leaf blowers, before there were rakes, there was leaf stacking. In this video, stack-master Perry Sugg demonstrates the traditional method of leaf stacking passed down through the generations in his home town of Princeton, North Carolina. Stacked leaves can be carried by hand, without the need of implements, tarps, bedsheets, or containers of any kind. In 2008, Perry traveled north to Princeton, New Jersey, to bring hope and empowerment to a people worn down by the drone of leaf blowers. He is ably assisted by Sofia, Maya, Anna, and spunky cairn-poo Leo. For those in a hurry, skip to 1:10 in the video for the demonstration. "Viva la leaf stacker! Down with the leaf blower!" An internet search for "leaf stacking" yielded this completely different form, a game played by two to build a leaf mountainette one leaf at a time. Poetic and vaguely Bergmanesque. Even grey, drizzly weather can have a warm feeling of victory to it, the day after helping to save a crop of carrots from an impending freeze. The urgent call for help came via forwarded email yesterday, from Chickadee Creek Farm, run by Jess Niederer, just down the road from StonyBrook/Millstone Watershed Association. Nothing like a deadline to get the juices flowing. A field of carrots was ready for harvest and a potentially damaging snow was forecast. It was a good excuse to get out of Princeton and see where some of the food for the Thursday farmers markets comes from. Go to a farm, they say, and you'll be greeted first by animals. The chickens were happy to see us, though we had little to offer them, compared with the windrows of leaf compost they had been scratching at. During the mass urban rejection of leaves in the fall, it can be healing to visit a farm, where the wealth of nutrients in leaves are welcomed and put to use. That's Jess on the left, with lots of bags scattered about, already filled with carrots. Harvest was made much easier by a machine that had loosened the soil's grip, but also made the crop more vulnerable to a freeze. 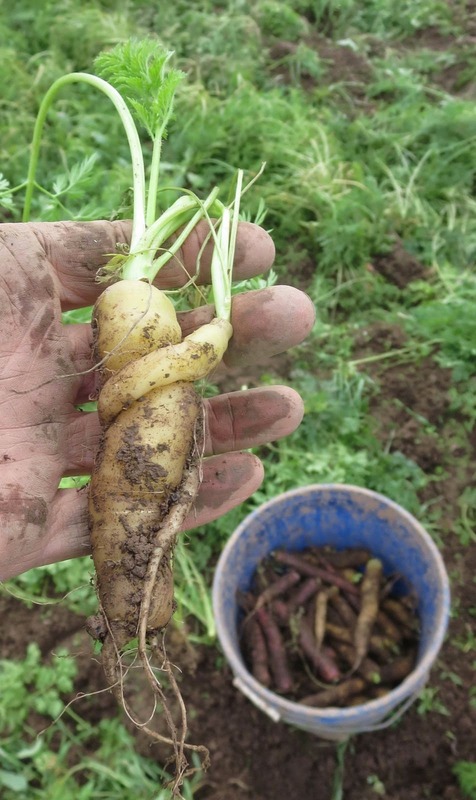 Carrots grew so densely, in five foot swaths separated only by enough room to accommodate a tractor tire, that the soil seemed to be solid carrots. The density made for a big harvest, and occasional promiscuity among the carrots. The field had a well-coiffed look, coated with ferny carrot foliage. One nifty technique for weeding Jess described is to walk through the field with a propane torch just before the carrot seeds germinate, and knock out any early weeds. After harvest, the foliage is left on the ground. One of the concerns going into the winter months is to have as much of the soil covered as possible--with crops or annual rye. Otherwise, the wind can secretly, invisibly carry topsoil away. This field won't rotate back to carrots again for at least three years. and an allee of miniature kale palmtrees lacked only Playmobile people for scale. "By my calculations, that's 4649 pounds of rainbow carrots and 500 pounds of watermelon radishes that we snatched from the jaws of the weather beast. Great work! Thank you, thank you, thank you. As Karla said yesterday, it takes a village to raise a farm!" That's a warm feeling to carry us through a chilly Thanksgiving weekend. "He told me that in El Rosario no colony or even a cluster has been formed yet, and only an average quantity has been observed overflying the area. He confirmed the impressions that the way the Monarchs are arriving is very unusual and, being optimistic, it may be that they are flying too high up. Last, he told me that they have news that the massive colonies are possibly coming from the state of Tamaulipas." No updates since then. I want to say, "Come in, Michoacan. Do you read me? Over." Tamaulipas, according to google maps, is nine hours northeast of the traditional wintering grounds for the monarch. My concern has been that the migration behavior is somehow dependent on massive numbers, and that the migration could begin to break down if the population drops too far. Most farmers have switched to Roundup Ready corn and soybeans, due to higher yields. Marginal lands and roadsides previously allowed to grow habitat conducive for monarchs have been returned to cultivation. But NPR reports that the massive corn harvest this year could actually make farmers more dependent on government subsidies. A corn glut outstrips demand, lowers prices, farmers don't get a return on their heavy investment in seed, fertilizer and pesticides, and government price supports kick in. Meanwhile, trains are increasingly being used to transport oil, causing the risk of spoilage to increase as it becomes harder to get the corn and soybeans to market. In other words, a situation unhealthy for monarchs is proving problematic for farmers as well. For anyone curious about how or whether the government should intervene, this article makes for an interesting read. "I don't understand why people put leaves in the road, because that's, like, where they drive." These leafy fluff monsters appeared a day or two ago, cluttering gutters and hogging nearly the whole lane. One's on a side street, the other at one of Princeton's busiest intersections. One block apart, they are likely the work of one landscape service that came through whenever and dumped them wherever, indifferent to whatever rules might apply. There's reason to pillory these billowy blobs of spent tree garb. According to the schedule for Section 1, they arrived on the street too late for the last pickup of the season, which means even more staff time will be needed to double back and mop up these muppety, maplely masses of misplaced matter. One season's beauty begets another's. Seeds plant themselves well in our backyard, but sometimes I collect some, flattering myself that I'll have the time, ambition, and discipline to plant and tend them. Wait until the stem below them has turned brown, be messy (i.e. spread the wealth), take only a small portion from any one plant. For better or worse, I put them in plastic sandwich bags whose plastic is not completely airtight. Usually they get marked with name, date and location, but it's also good to get familiar with their appearance, so you can identify a plant even when it doesn't have leaves or flowers. tan masses of deer-tongue grass, their seeds long gone. Members of the Friends of Herrontown Woods just found another cultural artifact to add to the mix of nature and culture along the corridor of preserved land called the Princeton Ridge East. To the various farmsteads and quarry operations can be added this curious imprint in the flat woodland at the north end of the preserve, carved by a bulldozer many decades ago and now left to slowly fill in with leaves. The "L" shaped hole appears to be several feet deep, and runs 100 feet in one direction, 50 in another. Is it more evidence of quarrying, or might it be a mid-20th century attempt at a groundwater-fed swimming pool that I had heard rumor of years back? I've written an account of the off-trail adventure that led to this discovery at the VeblenHouse.org website. Monarchs made their traditional appearance in the mountains of Mexico on the Day of the Dead, which is celebrated from Oct. 31 to Nov. 2. By November 2, according to JourneyNorth, the first several thousand arrivals had clustered on evergreen trees in Michoacan, with millions more still channeling south from Texas. Chip Taylor, who has made the monarch his life's work, predicted numbers at least double of last year's record low. That's the good news, but the cards are still stacked against the monarch, as long as agricultural practices in the central U.S. and elsewhere are geared towards exterminating the milkweed the monarch depends upon for building its numbers each year as it migrates north. Now for a little talk about the good, the bad, and the (far less emotionally gratifying) inbetween. It's human to want to draw a nice, clean line between good and evil. Mixing the two tends to diffuse the delicious, heady, mobilizing energy that drives many political movements. That nice, clean line also saves big-time on the mental energy required to make fine distinctions. But when it comes to chemistry, good and evil are often not inherent in a substance itself, but are more a matter of how much and where. Take, for instance, the harsh portrayals of glyphosate, which has become famous or infamous as the active ingredient in Monsanto's herbicide, Roundup. It's now broadcast widely to kill weeds in farm fields, and has had a devastating effect on milkweed populations critical for the survival of monarchs. Because of its relatively low toxicity and price, it's also used in very small and targeted amounts by land stewards working to restore forest and grassland habitat. Since the patent expired, glyphosate can be purchased from other companies than Monsanto. Shall we paint with a broad brush, and implicate all who use it as collaborating to poison our world? This assertion I heard made recently by a resident at a town council meeting. She also said, falsely, that glyphosate "is half of Agent Orange, and that's all you need to know." One doesn't need to make false assertions about glyphosate to question the way it is being used on such a vast scale. As Maraleen Manos-Jones explained as part of a recent, edifying panel discussion at the Princeton Public Library, Monsanto's "Round-up Ready" corn and soybeans now are grown on more than 100 million acres of cropland in the U.S.. Because the crops have been genetically modified to be unaffected by glyphosate, farmers can spray their fields indiscriminately, exterminating all weeds, including the milkweed the monarchs need to survive. Cornfields used to have enough milkweed growing in and around them to support monarchs as they migrated north. No longer. Meanwhile, even unfarmed areas such as roadsides are being managed in ways detrimental to the monarch. Herbicide use along roadsides and powerline right-of-ways, from my observation, is on the increase, and mowing in August and September wipes out flowers that could nourish adult monarchs, as well as any milkweed the caterpillars may be feeding on. That, plus the increasing extremes of weather, are the stark reality monarchs now face, and Ms. Manos-Jones is as good as any at sounding the alarm. She was the first non-native woman to find the monarchs' overwintering grounds in Mexico in the 1970s, and by her telling has risked her life to defy the Mexican mafia that, along with local peasants in need of wood, has been cutting and fragmenting the dense forest the monarchs use for winter shelter. To drive home the threat, she used an aerial photo of the forest, showing a patchwork of clearcuts right next to a grove of evergreen forest turned orange by clustering monarchs. She's involved in a program to plant tree seedlings in logged areas. But she also falls prey to a black and white apportionment of good and evil. Glyphosate is portrayed as a poison, pure and simple. That clear line may stir passion and a following. The thought of any herbicide getting into the body prompts a feeling of violation. But by laying blame on the molecule rather than on how it is used, people who use the herbicide responsibly are wrongly vilified. The indiscriminate casting of blame begins to bear resemblance to the indiscriminate use of herbicide. At the other end of the political spectrum, one argument used to question the existence of climate change is that carbon dioxide is a good molecule, necessary for plant life, and so couldn't possibly be doing any harm. But carbon dioxide is beneficial or harmful depending on how much and where. Even as a diffuse molecule in the atmosphere, its concentration has a big effect on the planet. In enclosed spaces, artificially high concentrations of carbon dioxide can, like carbon monoxide, be lethal. As appealing and convenient as it might be to brand glyphosate as an unmitigated evil, it's the least toxic among herbicides that land stewards have available. Now, the question often comes up, why must any herbicide ever be used for habitat restoration. Why don't land stewards just dig up the invasive shrubs? I would have asked the same if I had nothing more than a backyard to tend to. 100 acres of land choked with non-native shrubs whose foliage the wildlife refuse to eat is another matter. We could leave it be if we didn't want wildlife to have an edible landscape. We could dig the shrubs out if we had infinite time and energy, and didn't care about mass disturbance of the soil. Or, we could use tiny, targeted amounts of low-toxicity herbicide in much the way a doctor prescribes medicine. The comparison of herbicide to medicine is useful. Ever since Silent Spring, environmentalists have been devoted to freeing the landscape of the scourge of chemicals. When it comes to our bodies, however, environmental and medical thinking are seemingly at odds. Many of us prefer organically grown food, yet willingly ingest chemicals in the form of medicine. For instance, we don't view antibiotics as poisons, but instead make a clear distinction between their beneficial, small-scale, targeted use as medicine, and the much criticized, indiscriminate use of them in cattle and poultry feed. Interestingly, the vast scale of current glyphosate use has led to a sharp increase in resistance in weeds, much like indiscriminate use of antibiotics has led to resistant pathogens. The best medicine targets the pathogen in the body without affecting the healthy tissues. This is precisely what land stewards do when they dab a bit of glyphosate on the cut stump of an invasive shrub in the forest. A healthy skepticism about herbicides need not preclude applying the same distinctions drawn by medicine. In a forest that's been thrown out of balance, glyphosate can play the role of an antibiotic that, in small, directed doses is very low-risk, helpful and even critical, but becomes problematic when overused. The three other panelists exemplified this more nuanced, pragmatic view. Michael Gochfeld, Rutgers professor and co-author with his wife of "Butterflies of NJ", delved into the data on monarch population swings year to year. Most memorably, he described how profoundly weather affects the annual butterfly counts that often last only one day. Even if the sun just disappears behind a cloud, the butterflies are apt to disappear as well, and not get counted. He encouraged all interested to participate in the butterfly counts through the local chapter of the North American Butterfly Association. Robert Somes, a biologist with NJ DEP's Nongame and Endangered Species Program, said that concerns about monarchs are bringing attention to the work he and others are already doing to manage public lands for rare or endangered species. They use prescribed burns to promote habitat for the Aragos skipper, and clear invasives with a mix of minimal herbicides and mechanical methods. 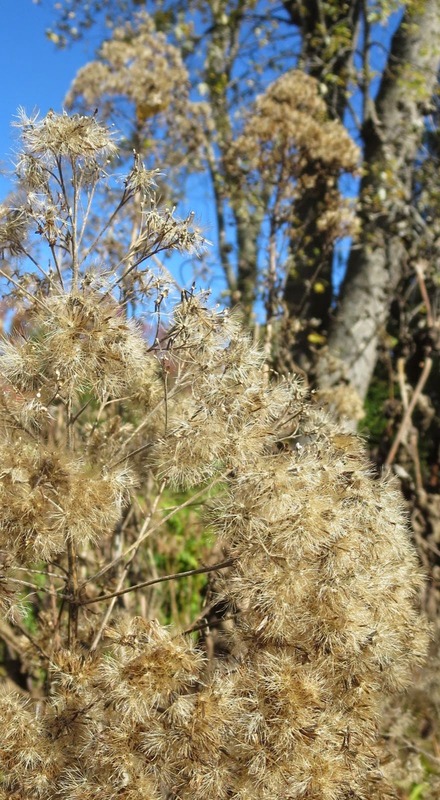 This work benefits local as well as migratory pollinators. Flo Rutherfeld, of the New Jersey's World of Wings Museum, was the last to speak, and gave some tips for gardening that caters to butterflies. 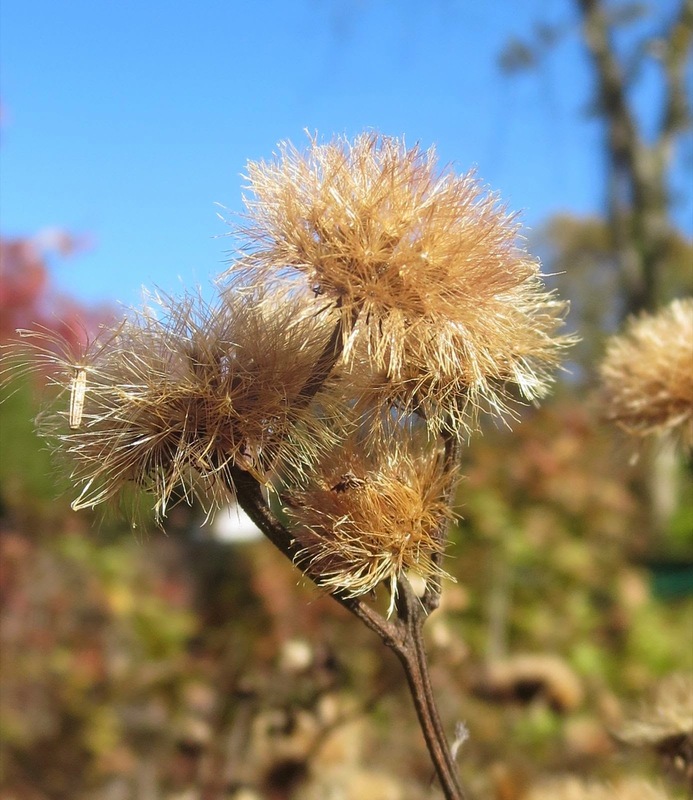 Have a variety of plants that will provide flowers from as early in the season to as late as possible. Morning Cloaks and Question Marks overwinter as adults, so are out and about in the spring. Monarchs will spot wildflowers more easily if they are clumped. Leaf litter is important for overwintering butterflies and moths. 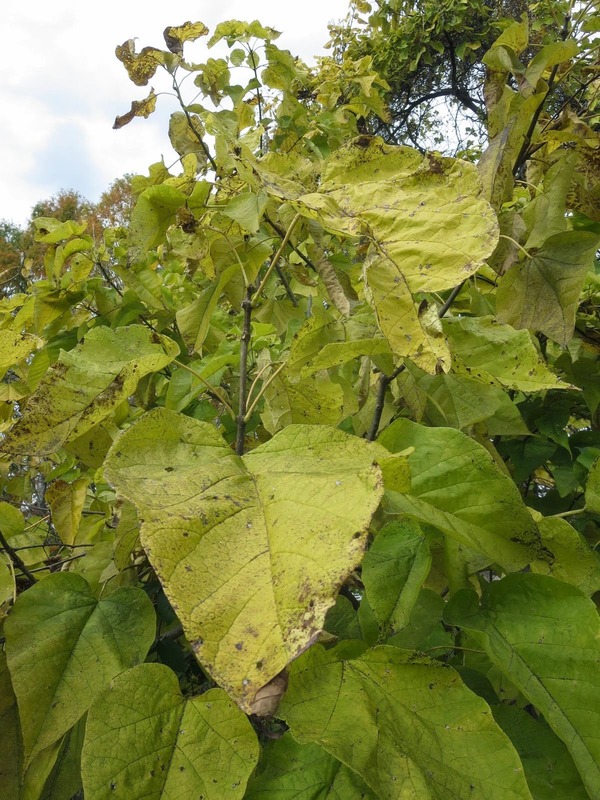 Some species even use decomposing leaves as their "host plant". Dog-strangling vine forms dense stands that overwhelm and crowd out native plants and young trees, preventing forest regeneration. Colonies form mats of interwoven vines that are difficult to walk through and interfere with forest management and recreational activities. Leaves and roots may be toxic to livestock. Deer and other browsing animals also avoid dog-strangling vine, which can increase grazing pressure on more palatable native plants. The vine threatens the monarch butterfly, a species at risk in Ontario. The butterflies lay their eggs on the plant, but the larvae are unable to complete their life cycle and do not survive." 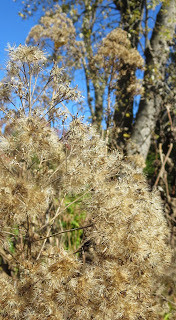 Walking through Herrontown Woods, catching some color to carry me through the winter. Browns and yellows dominated. Beech leaves from green to yellow to copper. Winterberry leaves that donated generously to the local insect society. A solitary crabapple persisting in the shade. colors that in their customary brightly lit gas station habitat would be brilliant red. 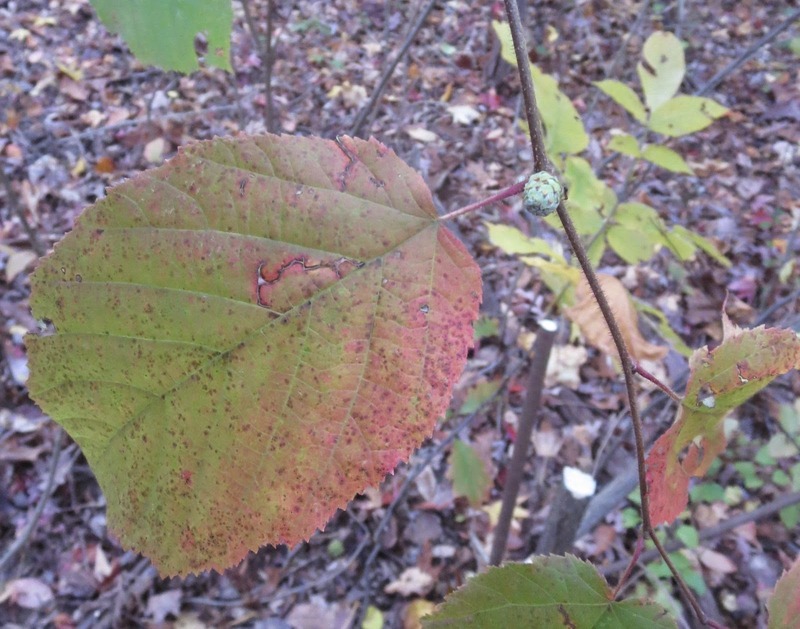 Elsewhere in Herrontown Woods, along the flat top of the Ridge, the wind conspires to highlight the distribution of wineberry, flipping the leaves over to expose the white underneath. The uncommon color of the gratefully numerous maple-leaved Viburnums. The same arrowwood in full sun at the Princeton Healthcare Center has a different hue. 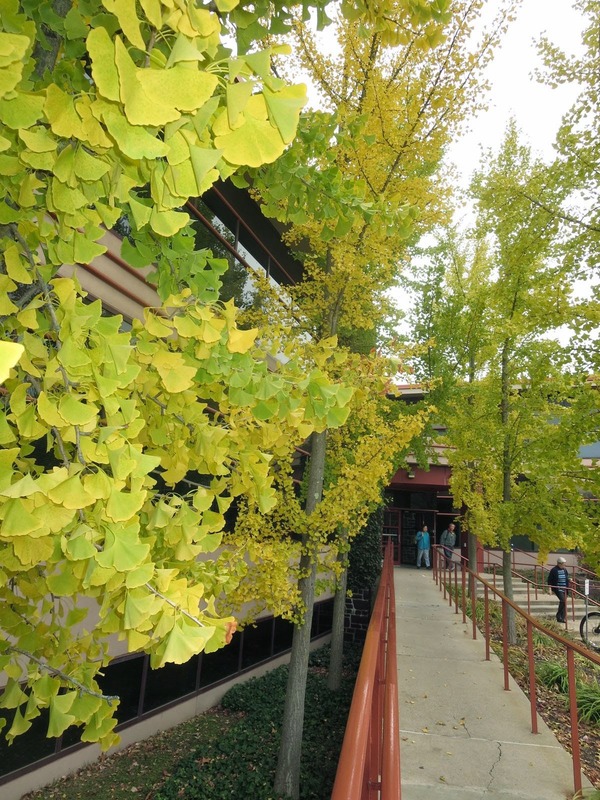 With more color from ginkgos to absorb on the walkway. While the persimmons across town, growing up to the pedestrian bridge over Washington Rd on campus, go begging, their Princeton orange just beyond reach. "LA Has a River? : Reviving America's Most Famous Forgotten Waterway". The river is completely lined with concrete, and yet there have been efforts to restore habitat within this massive concrete channel. Art plays a role in bringing life and people back to what was intended to be a giant ditch. Jenny lived in California for many years and was actively involved in the project. Jenny has also organized a panel discussion on art's connection to nature, on Thursday, Nov. 13, 4:30 - 6 at Guyot Hall, Rm 10, entitled "What Arts are Good For". The most recent panel, on "What Literature is Good For", was excellent. The woodlands of Princeton have long held a paradox. Abundant food in the form of non-native species has gone begging while deer and other wildlife stubbornly maintain their preference for eating natives. The result is a continuing imbalance as the non-natives gain competitive advantage and dominate the understory, forming what is essentially an inedible landscape. 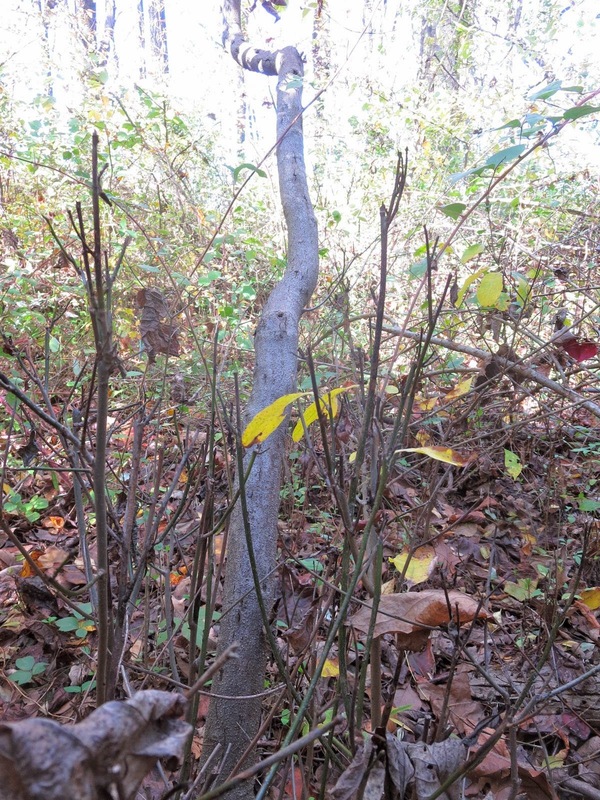 Here's the classic example--a native spicebush with one main trunk large enough to escape the deer, but with any new shoots from the base getting eaten down. Those stubs of new shoots--dense stunted growth reminiscent of witch's broom--are a sign of heavy deer browsing. I hadn't seen anything similar on the nonnative shrubs like winged euonymus, Linden viburnum, privet, and asian photinia. Last week, though, I saw something that would suggest that the forests grip on paradox is loosening. 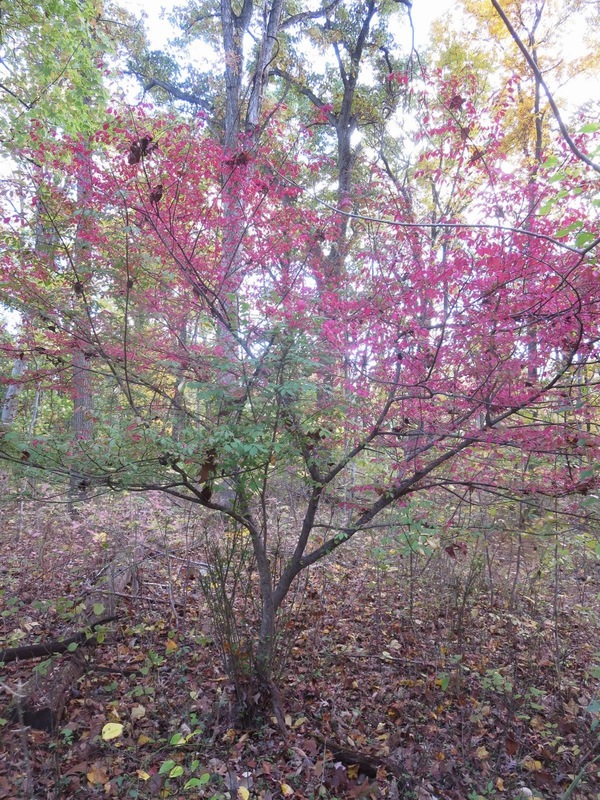 Here's a typical winged euonymus, showing off its pink in autumn's color-coded forest. If it were in full sun, the fall color would be bright red--thus the common name burning bush. Its ability to successfully invade and dominate in our preserves owes much to its inedibility. The native Euonymus shrub (E. americana) by contrast is a favorite of the deer, and is browsed so thoroughly that it survives only as sprouts here and there on the forest floor, a few inches high. But what's going on there in the photo, down near the ground, to the left of the trunk? This nonnative Euonymus has sprouts that look a lot like the browsed sprouts of the native spicebush. 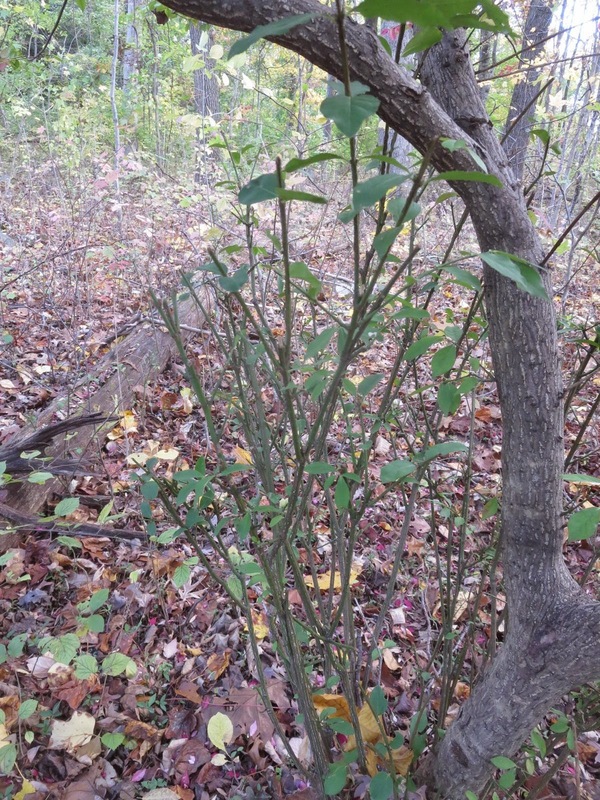 And this invasive Linden Viburnum, cut down by volunteers with the Friends of Herrontown Woods maintaining Autumn Hill Reservation's trails--the new sprouts from the stump are getting browsed by the deer. These are heartening signs that the deer may be, with an emphasis on "may", expanding their diet to include more invasives. The question for land managers is whether we could help this process along. I recently heard a testimonial that the mint-flavored sprays used on hostas and other plants to discourage deer browsing are actually effective. Perhaps there's a spray that would attract deer to invasives, and begin training them to consume them more. Is food preference learned or instinctive? Does one generation steer the next towards particular foods? In the meantime, we walk the trails cutting invasives here and there, deer-like, applying the sort of steady browsing pressure on exotics that deer have shown can be so transformative when applied to natives. Normally, without a little dab of glyphosate applied to the cut stump, the shrubs would simply resprout and need to be cut again the next year to keep the trail clear. But if the deer cooperate and browse the resprouts, then some progress towards shifting the balance towards native species could actually be made, even without the stump treatment. If this is over-optimistic, blame it on the uplifting nature of a brisk autumn walk in the woods. Slow-mo wrestling match. The bark of a dogwood trunk has completely enveloped a Japanese honeysuckle vine that had grown around it. The vine was squeezing the trunk, and now the trunk is squeezing the vine. I cut the vine at the bottom to improve the dogwood's prospects. A lone hazelnut, with a lone female flower bud. 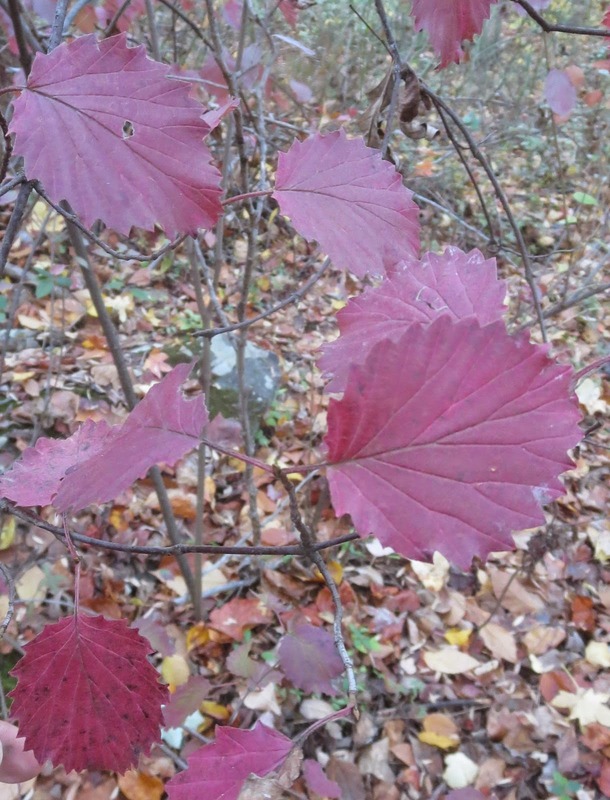 Autumn color-coding in the forest makes it easier to discover the solitary hazelnut shrubs scattered across Princeton. I know of one in Autumn Hill Reservation, two in Herrontown Woods, and four at Mountain Lakes Preserve. Sometimes it seems like all this talk of the Anthropocene is making people think that "old nature" is no longer relevant. Those of us who work to restore habitats are seen as sentimental diehards longing for a past that no longer exists. Similar dismissal of the past occurred in other theaters of endeavor in the 60s and 70s, as beautiful old buildings were boldly displaced by modernist structures that are now viewed with regret, and centrifugal forces pushed jazz into ever more discordant realms. In jazz, I remember the value of the past being rediscovered in the 1980s, led most notably by Wynton Marsalis and his work to reintegrate the styles of Louis Armstrong, Duke Ellington and others into contemporary music. Architecture, too, rediscovered the beauty and wisdom of past eras.